Planting seeds through incessant touring across North America and Europe, Striker are a rare breed who feel very self-contained in their activities. Their DIY philosophy negates any need for a record label at this point, as Play to Win is the band’s sixth full-length and third in consecutive years for the group. And it feels like these Canadians aim to take their exciting, potent blend of melodic hard rock and metal influences into another level of focus – making the tones, attitude, and outlook that much stronger than previous output displayed. The guitar accents at the end of certain verses – or sprinkling in specific, quick hitting melodic runs – supplement the proper catchy riffs and harmonies that penetrate winners like “Heart of Lies” and “On the Run”. The exotic, darker textures to “Summoner” make this a headbanging highlight- the crunchy passages against the complementary guitar/vocal-oriented chorus hook sure to elevate bodies and touch that proper metal nerve. Striker excel at using their four-part or more vocal harmonies to the hilt – taking things into AOR/melodic hard rock heaven, conjuring up visions of Loverboy, Dokken, and even Def Leppard during the Sunset Strip-groove like title cut, while the subsequent power ballad “Standing Alone” showcases Dan Cleary’s versatile pipes and ability to hold out numerous melodies in that deeper, emotional magnificence that brings people back to the greatness of the genre. 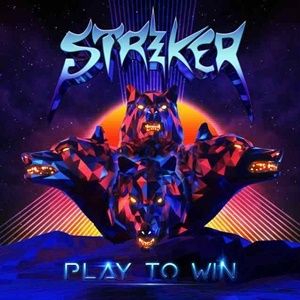 It’s difficult to consider Striker in one specific style of metal these days – their influences are very broad across the 80’s spectrum from Maiden/Priest/Ozzy to arena-level artists, as well as some heavier power/thrash dynamics added to the mix. The production quality rivals many of those classic acts – knowing when to go for that money shot ‘woah’ gang vocal during “Head First”, or the emotive lead break courtesy of Tim Brown during “Heavy Is the Heart”. If looking at the discography in a nutshell, Play to Win probably represents their broadest example of their melodic hard rock propensities, while still throwing down some killer metal parts and energy in the process. Given the fact that they’ve been making quite an impression on diverse tours here and abroad, the future continues to look very promising for these gentlemen.